This playful take on tarot makes divining the sacred mysteries of “what’s for dinner tonight?” a snap. Simply lay the cards out three at a time and voila—a meal appears, a vision from the spirit realm. This dining divination game can be played alone or with hungry friends to give apathetic appetites a mystical nudge in the right direction. First off, I would like to inform you all that this is not really a tarot deck. Yes, you can divine what would be best for you to eat for lunch or dinner, but you cannot use these cards to do a reading about your life, or a particular choice, or anything like that. That being said, I do see these cards as being useful if you truly want to know what the universe is recommending for you food-wise (out of the foods provided in the deck of course), and you can also just use this deck to make your family and friends giggle. I do believe that humour was involved in the making of these cards, especially when reading some of the card titles (see 2 pictures down). A few of them definitely made me giggle! I couldn’t resist posing one of my food candles with these cards! I also really enjoy the art on these cards! There was definitely some humour involved in the visual aspect of these cards too, since the style resembles the style of the original tarot cards (a.k.a. the Rider-waite Tarot Deck). 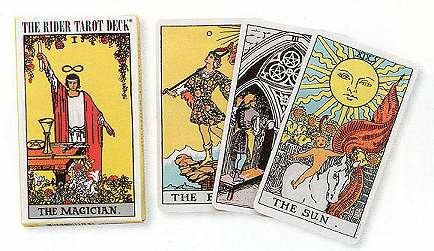 Some of the same symbology is used in the Food Fortune cards as most actual tarot decks as well (you can spot them here and there). I also like that you don’t have to be a tarot master to use these cards, and that they have downloadable instructions at the bottom of this page. As you can see just below the “Product Description” title above, I did a 3 card spread the day after I received the cards, and it was all very straightforward (there are other spreads to try also)! I definitely recommend this deck, whether you really struggle with food choices, whether you want to have a laugh, or even if you simply enjoy the art on these cards! THANK YOU SO VERY MUCH FOR READING MY REVIEW! DO YOU YOU DO OR RECEIVE TAROT READINGS? DO YOU EVER STRUGGLE WITH WHAT TO EAT FOR LUNCH OR DINNER? LET ME KNOW IN THE COMMENTS! Hehe! Yeah and the deck doesn’t cost too much either!